Nice discussion here about Virtual Tour versus Video. ✓ Video - any studies on this topic? ✓ Matterport - @Metroplex360 - while I could imagine that Matterport tracks this, but we don't have access to it. Could we ??? ✓ other 3D Tour service? Ideally, please link to the source for your answer. Active viewing time is one of the metrics I capture at SeekBeak. People get access to all that data for their own 360's via the reporting suite, but I've never looked at it overall for the whole site. Let me write a few queries and I'll see if I can get some useful data straight from the horses database. In my opinion viewing time is deceiving. If we are talking about a house, a person will view any media for as long as it takes them to make a decision. Whether they are interested in it or not. If it is the type of house they are looking for they will spend more time, if not they will go on to the next one. With any media if a person is interested they may go back and view or explore the media many times and spend various amount of time looking. If it is a house they are interested in they may share with friends or family to get opinions. One person could spend 1 minute viewing and decide they want to call the agent for a live viewing where as another person may need to view or explore many times to make that same decision. Good point about viewing time Helen. Maybe click count would be another metric to consider. As much as I like video home tours, I'm reluctant to watch any instructional video if a text version exists on the Web. But if I'm really interested in a home, I'd probably watch a many videos that were out there about it. These are Google stats from 2011 but maybe than can provide some general insight. They're public stats so they're on Inman an other sites. That means that most people used video to learn about COMMUNITIES in 2011. HotonHomes.com is a weekly TV that showcases homes using video. A big part of a video tour is showing people the community around a home. Many VR tours only show you a home. If these stats are true, maybe site owners who host video or video tours should show communities too. Those community stats reminded me of this old project. Last year I created a quick multi-pane Windows desktop program that might help realtors and home buyers. The right two resizeable panes show two views of a real Matterport model running in two separate Webbrowser controls. It's the Landry home. 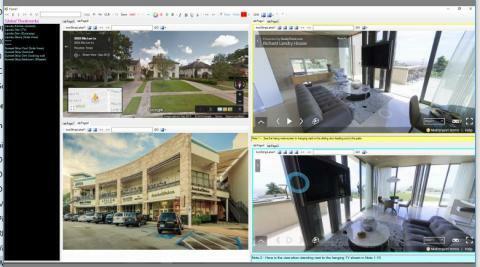 The top left pane shows an external Street View map of a home. That is a real Street View map of a random home I found on Street View since I couldn't find the real Landry Matterport home on Street View. The bottom left pane shows a shopping area. That's just a dummy placeholder photo I used to see how the whole UI would look containing external views, community views and different views from inside a VR home (Matterport in this example). That community view could be a 360 photo or video if one existed. Each pane is also zoomable to full screen if you want to focus on a specific thing. Viewing a UI like this, people could see lots of things about a VR home they're exploring. A pane or window showing things to do in the community, recreation, parks, etc would be a big part of the tour. Tabs or arrow controls in this UI's bottom left pane could allow users to cycle through other sights around the community as easily as they move around in the home model. If users had multiple monitors, they could open up as many panes as they liked on different monitors. The left black pane is where I put simulated bookmarks. If Matterport's SDK ever allows us to jump to locations on demand, I could give people the ability to bookmark their favorite locations from all models they've ever visited. Short yellow and turquoise notepads below each pane let users jot down notes about what they see. The big surprise to me in those stats is the number of people who use video primarily to view the community that surrounds a home they're interested in. If anyone gets the SpotonHomes TV show, you'll see how much emphasis their videos place on the surrounding community-- parks, shopping centers and even neighbors. Why not simply show the home? Maybe those Google stats explain the reason. Those community shots may be more than an after thought. Still, 48 seconds is pretty long!